We just passed a major milestone in our generosity initiative...we're six months in! That means that we are about 20 percent of the way to reaching our goals. Remember, our primary goal has always been 100 percent involvement. We want you praying, seeking, and drawing closer to God through this whole experience. Like never before, we want you taking new ground in your walk of faith with Him trusting in areas previously not available to Him. While you're taking those monumental steps individually, we are taking steps collectively like never before. We have one full season under our belt with our new camp. A season that included 1,410 campers, over 1,000 Difference Makers, and 81 decisions for Christ! We paid off over a million dollars of our debt! We launched our first new campus in Monmouth, IL, experiencing three baptisms in three weeks, and are preparing for a second new campus launch before year's end! We have 18 full-time DEVELUP residents going strong and being deployed into our locations and ministries! We started improvements at many of our existing locations too! All of these initiatives are going full steam while we continue our regular day-to-day ministries. It's amazing what just six months can do when we focus on letting Jesus have greater control in this major area of our lives. I want to thank you for letting God lead you, in partnership with thousands of other like-minded disciples, to help build the Kingdom, both in you and through you! 52. The number of interactions I would have with a child in a year, if every child attended church once a week. In one weekend of Camp there is an average of 42 hours where pastors, directors, and small group leaders receive uninterrupted time with students. Significant breakthroughs in a faith journey take place in that time span. Below are a few that I witnessed personally through my five weekends of camp. Breakthrough #1: Conner struggles with social interactions and large group worship. Conner attended camp where he worshipped freely, sang for the first time in months, shared in a small group, got asked to be on a dodgeball team, shot a BB gun for the first time, and felt safe and accepted. Breakthrough #2: Josh has suffered the loss of both his mother and baby sister. Josh came to camp ready to grow his relationship with Jesus. Each session I watched him cry out to God. He would share what was challenging him - he couldn’t wait to memorize 52 verses. Josh poured out his burden for a young friend who was suicidal. He wept over losing his mom and not wanting to lose anyone else. Josh cried out and shared feelings that had been inside for years. He was reminded that he can be rooted in God’s love. Breakthrough #3: While most girls were excited to be at camp, Skyler specifically desired to grow her relationship with God into an intimate, personal one. During the second session, I watched as almost my entire small group went forward to make a decision for Jesus. Skyler was one of them. They shared about the change they felt in their hearts. Skyler and I started a Bible study about next steps in your walk with God. I baptized Skyler in front of her entire family and our church body. Skyler began serving in Crossing Kids and is unashamedly sharing her faith every chance she gets. Crossing Camp provided the environment for these breakthroughs. I am forever thankful for that to be my family’s second summer home. I am very thankful for the 2018 summer camp experience! I was able to attend Kids Camp with one of my daughters, and brought my other kids along. When we arrived, I was filled with excitement to be at such an inviting place, with a blessed staff. As the parent, it was the ultimate Camp experience! Seeing all of the kids so engaged in singing songs to the Lord, dancing, and having fun brought a smile to my face. As we were leaving the auditorium a greater joy was approaching. My daughter, Jaimie, decided to get baptized at Camp! The time had come, we stood in the lake, took her confession, then dipped her in the water. As she came out, I held onto her in an emotional state, for I knew what happened: Jaimie’s life was given to Jesus! It is a memory I will hold onto from Camp this year. One year before that, my daughter Jaiden was baptized at The Crossing and a few years before that, I was as well. We are hoping to baptize our youngest daughter too! The Crossing means so much to our family, and we are blessed to be a part of it. The time I spent at Crossing Camp was a time to be remembered. It is still bringing forth conversations between us today. As a family, we are already looking forward to Camp next year. Thank you to everyone who was, and is, involved at Camp, through The Crossing and Wreck the Roof. As a mom, I appreciate every effort that made it possible to give my kids a chance to grow in their walk with God. I’ve been going to The Crossing, with my Grandma, since 6th grade. I had been talking to my Grandma about getting baptized and there was nothing she wanted to see more than that. She paid for me to attend Student Camp, because she knew how important it was to me. As soon as we arrived at camp and went to our first session, I knew it was going to be an amazing opportunity, and I met awesome new friends. On the first night, we met our small group and our leaders. My leader asked all of us what we wanted to accomplish, and I told her that I wanted to have an intimate, personal relationship with Jesus. After praying, I felt that relationship become a reality on the second night. One of the most amazing things I heard that night was “God is WAITING for us to come. It’s never too late to find that relationship with Him. The God that created mountains, oceans, and the galaxy died for YOU. And He is waiting for you to come to him.” After hearing that, I came down to the steps and just prayed that this would be a life changing experience. I shared with my Grandma everything that happened at Camp. She was so proud of me. Less than a month later, my grandma was in the ICU for organ failure. A few days later, she passed away at home. My new friends, and especially my small group leader, supported me through it all. I let go and trusted Jesus. If it weren’t for Camp, I’m not sure where I would have been. On August 12, I got baptized, and it was the most incredible day of my life. I am now a small group leader in Crossing Kids, and I can honestly say that Camp changed my life. Crossing Camp is a safe place where lost and broken people can come find Jesus and an intimate, personal relationship with Him. In April of 2018, we celebrated a challenge to our entire church body to Wreck The Roof of our gen- erosity in order to make Christ’s Kingdom grow. The crowbars and the sledgehammers came out, and we celebrated over $26 million in commitments and expected gifts to do exactly that! We are not asking for the Lord to do this for us without joining with Him by trusting in His provision and boldly standing on His promises. We believe that He has already supplied us with all that is nec- essary to accomplish what He has called us to, so we are only acting in faith to release that provision to His purposes. Inside this update are some of the incredible stories of regular people who are actively Wrecking The Roof of their limitations and stepping out into the new territory where Jesus is leading. Thank you for your part in the stories God is writing on our hearts together, and let me encourage you to continue to keep stepping out in faith, with the rest of us, to make it happen. For us, Wreck The Roof has been more about opportunity and excitement than anything else. Having both been raised in Christian homes, tithing is something we were taught to do and was fairly automatic. We did it out of obedience to help the church function and meet its day to day operating needs. Like many, we went through the initial process of praying and talking about what we could do above and beyond our normal giving, and that exercise was both challenging and rewarding. But for us, the thought of what our church could accomplish with this initiative was the driving force behind the number we wrote down on our commitment card. As we write this, fresh off of a visit to the first weekend at our new camp, we cannot even begin to put into words the joy we have knowing that our collec- tive sacri ce helped make that possible, and that’s just the beginning. Very soon we will be able to visit new campuses and literally see the faces of people who may not have met Jesus without our commitment, as a church, to reach them through this initiative. We’ll be able to see new leaders being raised up through our internship program. We’ll see dust flying at each of our existing campuses, doing whatever we can to make our facilities more equipped to reach the lost people in our region. These are the things that drive our giving to Wreck The Roof, and we couldn’t be more excited to continue to play a small role in making all these things happen. Many times in the Old Testament, when God did something big, the Israelites would build a monument of stone at that location to commemorate and remember what God did there. We can’t help but think that our camp, our new campuses, and even the improve- ments at our current locations will similarly stand as reminders to us of the big things that God accomplished through our generosity and commitment to Wreck The Roof. My wife is a creative and innovative person. I am not. However, we both have the ability to recognize good ideas and what it takes to implement them. We are both early adopters of necessary change. 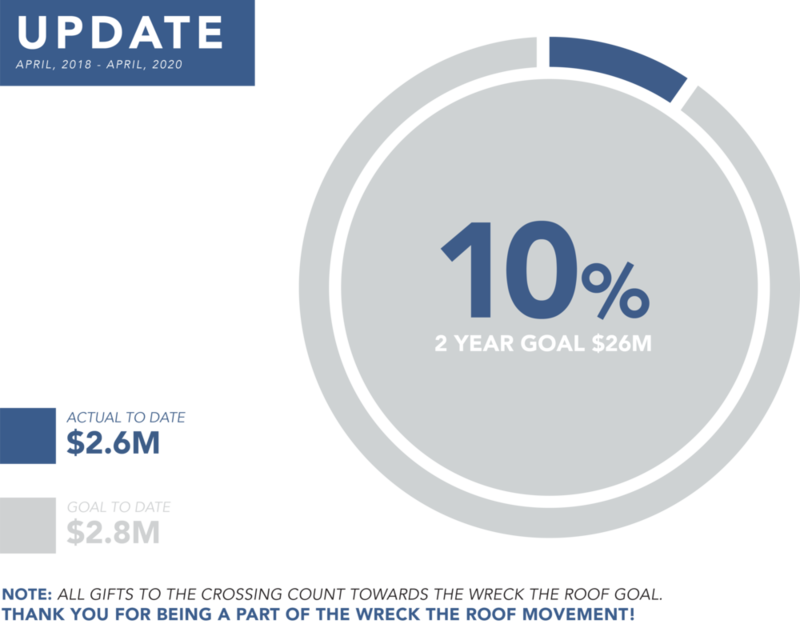 We were ready to open our checkbooks at the very first meeting regarding the Wreck the Roof initiative, but we did not understand the magnitude of what it meant to Wreck The Roof of our generosity. It would take prayer, lots of prayer, to discern God’s direction. In October of 2018, my wife will have been a nurse and in the work force for 40 years, and she had plans to retire. It was not because she was too old, or too frail, or too ill to continue nursing, but she had reached the limit of her tolerance for the way healthcare policies interfere with the simple act of caregiving. Her prayers and the Holy Spirit changed her heart and, because of that, she has decided not to retire for the next two or more years so she can joyfully give more to the Wreck The Roof initiative. As for me, I have a rather unique opportunity to work extra hours when needed, and I am dedicating an additional 48 hours per month (two weekends) for the next two years so we can increase our contributions to Wreck The Roof. We are joyful for Wreck The Roof and very thankful that The Crossing has given us the opportunity to give our blessings back to God in order to build His kingdom. It is not uncommon to drive through a neighbor- hood and see children selling lemonade in their front yard. We have grown accustomed to seeing these makeshift lemonade stands run by future entrepreneurs of America. A few weeks ago, my children became part of the lemonade stand busi- ness. While most children are working towards new bikes and video games, my kids were work- ing towards something completely different. They were wrecking their roof! Ethan and Ella set out with a goal to make twenty dollars to help plant a new campus. While there are new toys they would love to own, they were more excited about giving to Wreck The Roof. The day they set up their lemonade stand was a hot one. It was the kind of hot that makes you want to either be inside or in a pool. Ethan and Ella did not let the heat hinder them. They took boxes from our recent move to make the counter and talked their grandmother into walking to the store to buy supplies. They were open for busi- ness. Once open, they decided selling lemonade at twenty five cents a glass was not going to make them enough money to reach their goal of $20, so they expanded. They wrote books and poetry and found toys that they could sell. At the end of day one, they had raised $14! They were still deter-mined to meet their goal, so they made plans to sell for a second day. They ended up with a grand total of $22 over two days of hard work! Jesus taught that we need to be like children, and my kids have de nitely taught me through their business endeavor. They worked hard, and were generous, to make sure that other kids would be able to go to the church that they love so much!